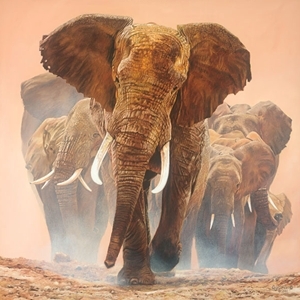 Big Daddy by African wildlife artist Dan Combes available from Prickly Pear Galleries. Artist Guy Combes’ star in international wildlife painting and conservation continues to rise. He is actively involved in several groups including the Soysambu Conservancy (protection of Africa’s Great Rift Valley ecosystem), the Action for Cheetahs in Kenya and efforts to prevent the Tanzanian government from building a road across the northern migration routes of the Serengeti National Park. Elephants are another of Guy Combes’ beloved causes. Canvas released November 2011, gallery wrap available. Gallery wrap for Big Daddy by Guy Combes.